The year is Universal Century 088. The war between the AEUG and the Titans has been fought with the AEUG emerging victorious after the Gryps Conflict, but only just. The crew of the AEUG flagship, the Argama, are in need of a place to rest. More importantly, they need to get medical assistance to those who were injured in the previous confrontation. As the battle with Axis and the Titans is still fresh, Captain Bright leads the Argama to the colony of Shangri-La (Side One). As the fragile alliance between Axis and the AEUG crumbles the intention of Axis, now Neo Zeon, is made clear. The Endra commanded by Mashymre Cello follows closely behind the weary and worn Argama. In the faded colony of Shangri-La mobile suits will fight, rivalries will blossom, new alliances will be made and Newtypes will awaken. I'm a big Gundam fan so my expectations were high, perhaps unfairly so for Double Zeta Gundam (ZZ Gundam). Having been knocked sideways by Zeta Gundam. I expected epic battles, angst, high-emotions rebellions, counter rebellions and a bit of nuance on the "Good vs. Evil" story. I knew nothing of ZZ Gundam going in but I carried the baggage of Mobile Suit Gundam and Zeta Gundam with me not knowing if I would need them. Was this a proper sequel or was it just set in the same timeline? Answering the last question directly it is a direct sequel and makes reference back to Zeta Gundam almost instantly. I'm not normally one for spoilers but to put things in context I'll summarise the end of Zeta Gundam. I'll keep it to a minimum and to one paragraph, so here goes ... Spoilers to follow between the images. At the end of Zeta Gundam Kamille Bidan faces off against Paptimus Scirocco of the Titans. As both are Newtypes they bring their respective power to the fight that rages not just with mobile suits but the mind as well. Somehow Kamille is granted and harnesses the power of his fallen comrades to defeat Paptimus. With is final breath Paptimus vows that he will not go alone. The Zeta Gundam returns to a triumphant but battered Argama. When Fa Yuiri goes to get Kamille from his cockpit it is clear that something is wrong. It's as if the prolonged conflict has finally taken its toll on his mind (perhaps what we would now recognise as PTSD). Getting Kamille off the Argama and into hospital is one of the starting points for ZZ Gundam. On Side 1 we meet the scavenger/junk dealer Judau Ashta, his group of friends and his sister Leina. Judau and his friends make an existence reclaiming tech and mobile suits from the previous conflicts and selling them on. When they find out the Argama is docking and it has the Zeta Gundam on board they hatch plans to try and steal it. Leina, the conscience of the group, isn't so sure it's a good idea. Over a series of conflicts with the Endra Judau demonstrates an ability to pilot the Zeta Gundam. Slowly but surely his selfishness and independence is used against him. He becomes a pilot on the ship as do his friends who all display abilities suggesting they might all be Newtypes. Neo Zeon is lead by Haman Karn (who we met in Zeta Gundam). She is supported by her loyal followers Mashymre Cello, Glemy Toto and Chara Soon. Mashymre is a giant and chivalrous knight (in his opinion) who is driven by honour and a fanatical devotion to Haman Karn. When in need of guidance he smells a rose she gave him and it is his inspiration in combat. He is a comedic figure but you sense that there is something tragic lurking around the corner. The noble blooded Glemy Toto, is scheming, charming and silver tongued. He is a bot of a second-rate Char Aznable about him and views all those around him as tools or pawns in his own chess game. As for Chara Soon, she is a bold, brash warrior who comes over all "hot and bothered" when entering a mobile suit cockpit. She also enjoys tightly clutching and "smothering" Judau when she gets the opportunity (perhaps some of the lowest points in the series). Returning to the idea of cyber-Newtypes we have Eleo Ple who has been bred and conditioned to fight. Initially, I found her highly annoying but as the series progressed, and leaving aside the changes in tone I will get to later, she was one of the more interesting and honest characters who goes through some development. Actually, the cyber-Newtype idea was a topic I hoped would be explored further. Within ZZ Gundam there were a few story-lines initiated that could have been really interesting to explore teens in wider society whilst telling a compelling story. What about the consequences of selfish behaviours or jealousy (both hinted at but never developed)? Perhaps it could have explored what can happen if you cling with single-minded obsession to an ideal. These kinds of stories I remember being played out in the cartoons of my youth which were released around the same time this was made which effectively mixed comedy and a more serious tone. Frustratingly these avenues were not explored or developed. It felt as if side-stories, including quasi-religious mystic groups on an abandoned colony, got in the way. There were lots of ideas without any follow-through. What we got was a tale of Judau and his (annoying) friend banding together to overcome great challenges without really having to put in any work ... And then onto the next one. To be fair there was some development of the cyber-Newtype that built on the "conditioning" of Four in Zeta Gundam but it felt under-developed. I really wanted to like ZZ Gundam. I have an image in my mind of what to expect and also what I like from the Gundam franchise. Parking the animation and design work to one side I don't think of comedy, farce, teen-japes and squabbling with cataclysmic events interspersed between them. ZZ Gundam lurches from comedy to farce to serious. This change in tone did not help the few story elements gel or progress satisfactorily. Careful application of humour could have given rise to some poignant moments and sadly those opportunities were not taken. Gundam shows don't have to be all heavy and broody. Gundam Wing (set later in the franchise and in a different timeline) managed to balance a lighter in tone with traditional Gundam elements. The intention with ZZ Gundam was to create a show that was lighter in tone than Zeta Gundam. 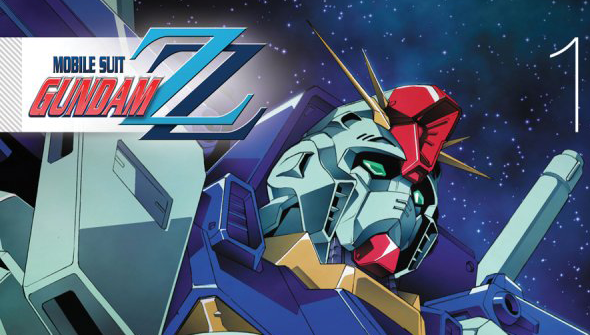 ZZ Gundam was a direct response to the serious, sombre and mature show that preceded it. We, o.k. *I* have to remember that Gundam was/is a show aimed at children and teens. This lighter or comedic tone within ZZ Gundam worked occasionally. Perhaps the best example involved Leina (Judau's sister), who felt like the motivation behind all of Judau's actions. The events depicted were absurd but highlighted the stress and confusion of the situation. This was mid-way through the series and I thought that it had finally found its rhythm. Sadly it went back to teen high-school like "drama" and I was back on the tonal roller-coaster where one minute they are fighting for their lives and the next "s/he loves me s/he loves me not" or one of my least favourite things "and he falls/is pulled into her chest ... again". I could partly forgive the tonal changes if the animation, design work and story all held up. The animation was serviceable, it did the job but didn't feel up to the standard of what had gone before. I'm struggling to remember a standout scene and even the opening hasn't stayed with me. My overwhelming feeling was that it felt a bit ... cheap. It lacked the polish of its predecessor and the boldness of the original. The designs of the mechs for Neo Zeon were disappointing. They did the job they needed to but nothing really stood out for me. All I can really remember are the garish colours. Some were interesting to look at, with designs that harked back to the original Zeon mobile suits like the Gelgoog, but as soon as we saw them they were destroyed. This kind of "mech of the week" concept that frustrated me in Mobile Suit Gundam and also upset its pacing somewhat (though I do appreciate why it was done in the wider context of anime merchandise). In some of the side-stories we saw original Zeon suits feature which when compared to the newer designs looked more impressive and weighty. It's almost as if re-using old designs was a trick to save money but it only highlighted weaknesses in ZZ Gundam. This show featured a new team of mechanical designers which included Yutaka Izubuchi who did design work for Patlabor. He also created and directed RaxXephon. 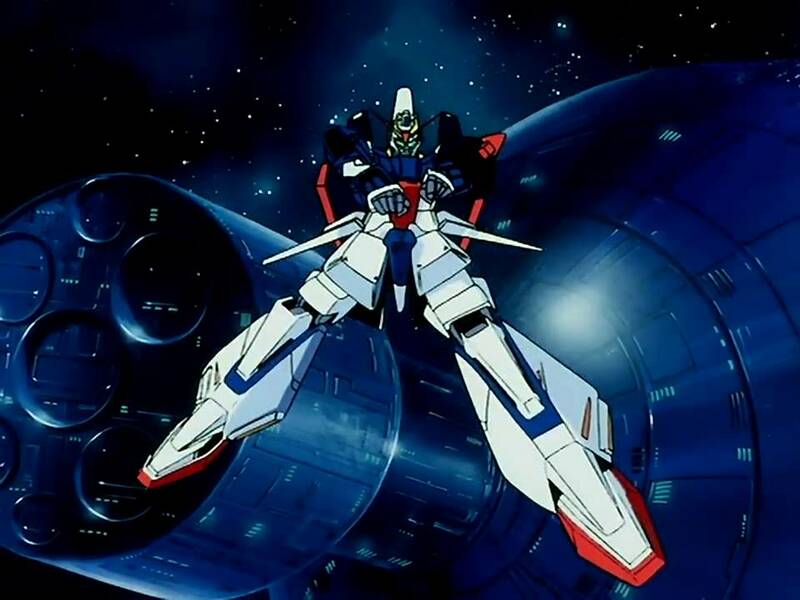 The mobile suits on the Argama were those featured in Zeta Gundam with the addition of the ZZ Gundam. Whilst not my favourite it looked strong and more than lived up to the reputation of a Gundam. The most fascinating new addition was La Vie en Rose which was glimpsed briefly in a previous series. This time we got to see more of it. It was a kind of giant support vessel shaped like a flower, with the engineering machinery looking like the anthers of a flower. I wish there had been other more bold designs like this. 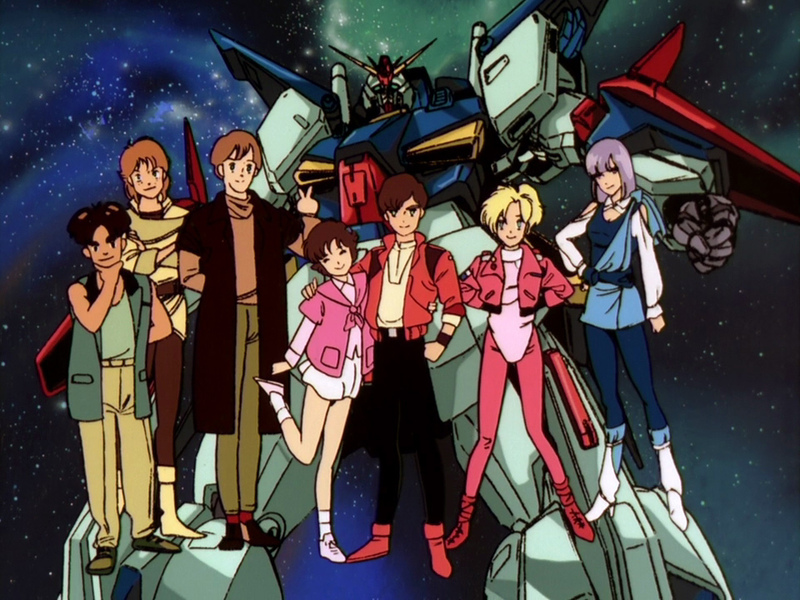 Whilst watching the show I found myself thinking back to Zeta Gundam and wishing I was watching that instead. 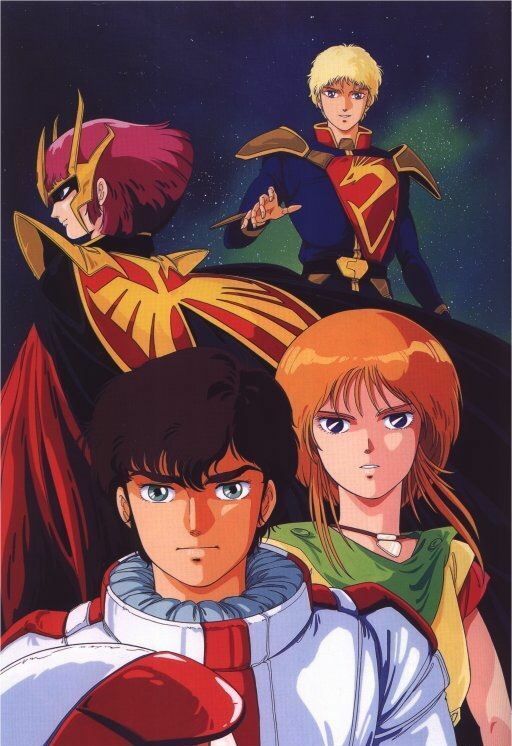 Since then I have tried to figure out why because it is not as if ZZ Gundam is a bad show. It is entertaining enough and I did make it through to the end. It had the feeling of a straight-to-DVD sequel to a blockbuster film. Some of the arcs gave rise to established characters like Captain Bright behaving completely out of their established personalities which whilst frustrating wasn't the main problem. It was also frustrating to see the cast be able to do everything without really having to work at it (something previous cast members did). My main issue was that it never fully committed to any story arc, idea or tone unlike its predecessors. An example would be that Judau is a naturally gifted (and arrogant) pilot and this causes friction with the rest of the gang but it was never embraced as a taken to a logical conclusion. The actions would be laughed off and that would be it. There would be similar instances of death and destruction but there would be no real follow through or weight behind it. Gundam and Zeta Gundam showed that actions or events had a consequence and the characters reacted accordingly. I think that was ultimately what it was missing. There is always a danger with a sequel. It needs to live up to what has gone before and take it somewhere new or further whilst retaining the spirit of the predecessor. ZZ Gundam was O.K. But none of lingered in my mind like Mobile Suit Gundam or Zeta Gundam. I think it would have been a more satisfying experience and worked a lot better if they had trimmed out some of the storylines, gone all-out comedy and set the series in its own universe/timeline rather than a sequel to what was a darker more sombre show. Whilst comedy is primarily based on personal tastes I think that a sense of consistency would have helped it gel more. I think then they could have made a zany, silly and fun Gundam show that could have been enjoyed for what it was. On balance ZZ Gundam is not a bad show, it is entertaining enough but not great. IN A NUTSHELL: At times comedic, farcical, angsty and serious, this show is inconsistent in tone throughout. It's entertaining enough but disappointing given what came before it.